When he was in prison on Robben Island, Nelson Mandela spent long periods engaged in hard manual labor— breaking rocks into gravel, and working in a quarry. You would think that this would be enough exercise for a day, but during these years Mandela also maintained a strict workout regimen inspired by his youth as a boxer. Why in the world would someone who’s breaking rocks do this? 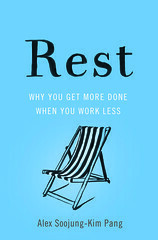 The answer reveals something about the nature of deliberate rest. So staying in shape was also a way of staying mentally sharp— which in turn was another poke at his captors. Why is Mandela’s routine an example of deliberate rest? It’s something that he does in order to maintain his mental agility and intelligence: it’s exercise intended to have cognitive payoffs. It’s also an example of (to borrow a phrase from Clifford Geertz, among others) deep play: it’s an activity that has significant symbolic meaning for Mandela, that connects him to his previous life before prison, and constitutes a show of resistance against his prison wardens and the state. And it’s an activity that connects to his broader life: it provides him the peace of mind and clear thinking he needed to survive prison life, and to emerge as a leader despite the harsh conditions of Robben Island.